NEW Fall Catalog Arrives & Registration OPENS Monday! Get ready to Learn Something New this fall with Community Ed! 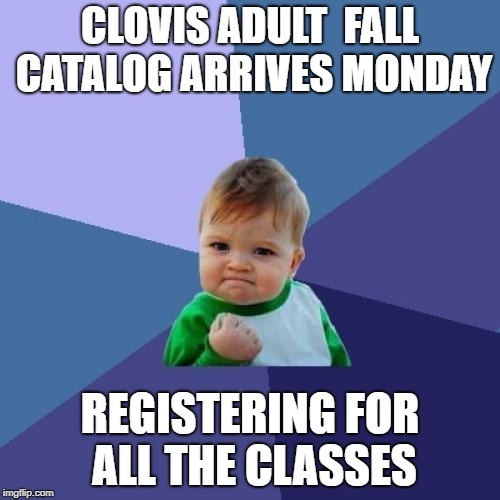 The Fall catalog mails out on Monday, so if you live in a Clovis or Fresno zip code, watch your mailbox next week for your catalog to arrive! Can’t wait for the mail? Click to view a digital version of the catalog right now, and you’ll be ready to sign up for classes when registration opens on Monday. New this fall – Sewing With Patterns, Singing Lessons, Acrylic Fluid Art, Gentle Yoga, Online Selling Workshop, Creative Writing, and more! Plus all the favorite sports, cooking, fitness, craft, computer and art classes! To sign up, go to our website, or register by phone at 559.327.2876. You can also stop by the Community Ed office – our summer hours are Monday – Thursday 8:00am-8:00pm, and we are closed on Fridays.